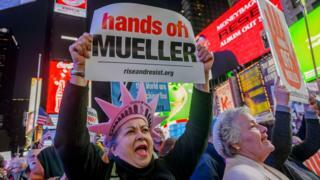 Last November, a crowd of people gathered in New York City's Times Square for a "Hands Off Mueller" protest. Andy Ratto, an organiser from the Rise and Resist group that co-hosted the event, recalled an "energised" crowd. "Around 1,000 people came, singing and chanting, holding homemade signs," Mr Ratto said in an interview. Now, four months after that event and 22 months since the investigation began, Mr Mueller has concluded his report. 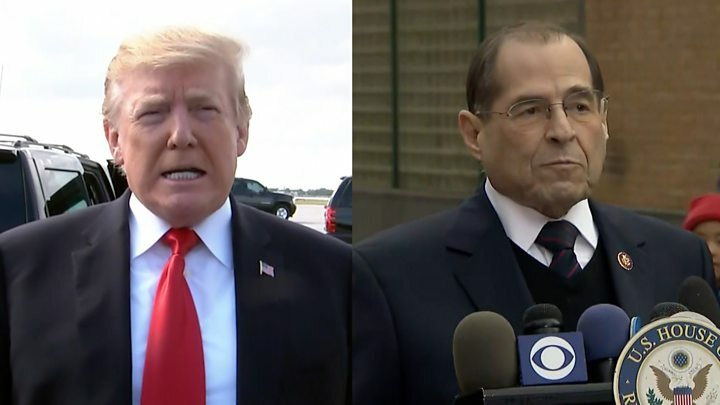 And, according to the initial summary - relayed by Attorney General William Barr - the president has been cleared of collusion. But according to Mr Ratto, it was too early to reach a conclusion. "I don't trust Barr's interpretation," he said. He also noted that 37 people had already been indicted in the investigation, including several of the president's close associates. "If Mueller had saved that all for one day, the political earthquake would have been astronomical and catastrophic," he said. Like many others - including a majority of Democratic presidential candidates - Mr Ratto now wants the report to be released to the public. He will also be staying tuned to more than a dozen other Trump-related investigations, he said. "This is one small piece of a much larger puzzle," he said. "Those who were actively engaged throughout tend to be those who don't treat Mueller as if he is a superhero who will swoop in and save the day." But there were plenty of people who put the former FBI director on a pedestal since he took charge of the special counsel investigation. Various websites sold "fan" merchandise, including T-shirts, hoodies and mugs. In New York on Sunday, at the launch of Democratic Senator Kristen Gillibrand's presidential campaign, supporters played down the importance of Mr Mueller's findings for the 2020 race. Several people in the crowd said they had not been pinning their hopes on the report as a game changer. "I don't think this will be a big voting issue," said Austin Bicknell, a student visiting from Seattle. "When people follow Trump down the rabbit hole, that is when we lose. But if we focus on healthcare, economic issues, healthcare, that is when they have a chance of taking him out." On a stage erected next to the Trump International Hotel, Ms Gillibrand referenced the report only briefly. "Nobody in this country is above the law or immune from accountability," she said. She has reiterated her demands for the full report to be released, as have other candidates, including Bernie Sanders, Beto O'Rourke, Kamala Harris and Elizabeth Warren. "The Trump people are going to say it is a big victory and that is very depressing," she predicted. "But that is why I am here, I want to see him defeated." Denis Lee Owen, who works in economic political development, agreed and said the emphasis on the report's delivery has been overhyped. "This is a process, not an event," he said. The podcast was started by AG - a pseudonym, because she works for the executive branch of the Trump administration, she says - in her kitchen in 2017, alongside two San Diego comedians, Jaleesa Johnson and Jordan Coburn. The podcast now gets three million downloads every three months. The Mueller summary was "definitely discouraging", AG said, but she wanted to see the report with her own eyes. The summary had left people with "more questions than we had when we went into it", she said. "It was all very carefully worked. The definition of collusion is very narrowly defined." "We'll see how it goes," she said. "There still seems to be plenty of interest. And I just don't think this report is a conclusion."